More GPS! Gooogle Penetrating System! 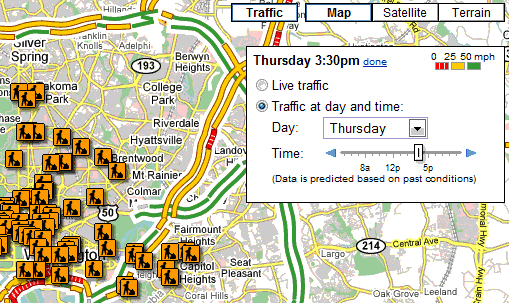 how does google maps real time traffic work? Now, I already know google collects their data from an amalgamation of sources, such as various city-maintained cameras that report to databases on the real time road conditions in their area. -Whats the *exact* name of the API call google uses to retrieve that data, and what parameters do they pass? Can you supply a real-world working example of such an API call? -What kind of technology do the cameras use - radar, infrared, motion sensors etcetera? How is the device powered? -Can you supply a link to a web page where I can buy such a camera or speed monitoring device? -What are the typical intervals bewteen cameras on a highway? 1/4 a mile? half a mile? two miles? Do you know how often these devices have to be serviced? -Can you tell drivers how to spot and identify speed-monitoring cameras on the highway? -Does google have to pay various sums of money to access this traffic information? Forget cameras, anytime you or one of your thousands of neighbors turns on their map while in the car, google collects information about actual traffic conditions. I've been on desolate roads in the middle of the night and literally watched the green line follow me down the road in g-maps. I'd say, for the Washington, DC area, that Google Maps/Traffic is correct, maybe, 50% of the time; at least for the areas I drive. That's good considering it was about 30% accurate not that long ago. I was also glad to see that secondary road traffic is now being included. (I'd love to see that 'predictive' feature included in the mobile version. I've turned on my GPS and google navigate and waited for the green line to litterally follow me down the road, and it doesnt ! Which is why I was hoping someone could explain how google updates its traffic layer ? Where did it go? The UI has changed, and that feature is gone! I hate how often Google removes features! !